Fiber is an underestimated ally that serves a valuable role in your health and wellness. High fiber intake tends to be associated with better colon and cardiovascular health, as well as a reduced risk of cancer and obesity. Unfortunately, the typical American diet is lacking in fiber. The averagefiber intake for all Americans over the age of two is 16 grams a day, with women consuming about 18 grams daily and men 15 grams on average. Current guidelines recommend that adults consume between 25 and 30 grams of fiber every day. Fiber is a starchy substance that passes through the digestive system untouched, meaning that fiber is not processed at all in the stomach or intestine. Fiber helps to slow the absorption of the foods you eat and it can also help to curb cravings you have by keeping you full for longer. Consider eating foods that are naturally high in fiber—like vegetables, beans, legumes, and whole grains —to help curb cravings. I, too, was a sweets junkie….until I had my blood test that revealed I was prediabetic!! that scared the hell out of me. But I have one word for all you sugar junkies out there; it’s an herb called GYMNEMA SYLVESTRE……..or just plain GYMNEMA…it’s an herb from India, been around for 2,000 years…..it’s called the ‘sugar destroyer’ as it keeps sugar from metabolizing too quickly in the intestine…..and you WILL not crave sweets if you take this on a regular basis…one capsule before each meal…..in fact, you will lose your cravings for sweets……PLEASE GET THE ORGANIC GYMNEMA & NOT the synthetic!!!! It has done wonders for me……..along with it, I cut back on refined carbs and in little over a year, lost THIRTY POUNDS….. I just watched portions, ate a little slower (no more wolfing down my food!) and without even realizing it, the pounds came off, and I was NOT trying to lose weight; just tryin’ to keep my glucose levels on an even keel.. So PLEASE you sugarholics, get a blood glucose test done, and go from there…it’s estimated that 30% of the population could be prediabetic & not know it……this is a dangerous thing!!! 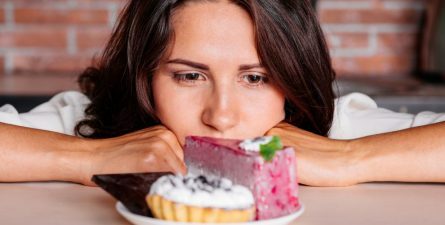 Eating more fat is the best treatment for sugar cravings. Many fats can be burned by your body like carbs, this is what your body is really craving. Plus it helps stabilize blood sugar. Lean protein is a terrible idea. Switch to tuna and turkey and watch your cravings get worse.